As in, the children's game. 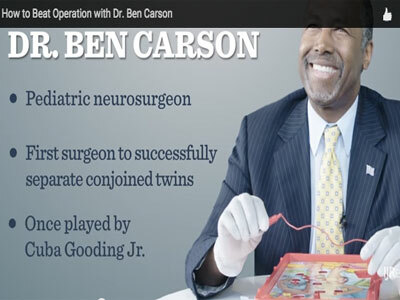 If you’re a surgeon who happens to be running for president, it makes sense to create a video of yourself playing the no-medical-degree-required children’s game of Operation, right? Sense or not, this happened today, in a video produced by IJReview, the second in what might as well become a 15-part series of Trump coverage deflection videos. This is, apparently, what it takes to overcome a 16-candidate GOP pool dominated by Trump antics (Trumpantics? ), because, well, Ben Carson is getting covered, and covered and covered. Better this for the candidate than the “What Happened to Ben Carson?” piece that just predated the video?